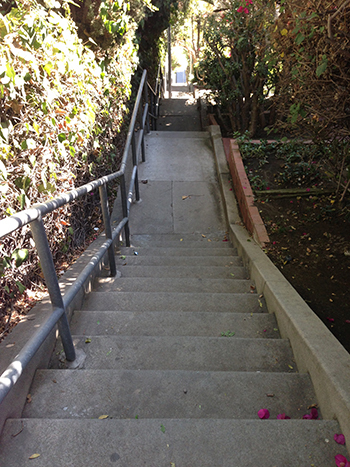 Summary: For me, this stairwalk isn't too bad, because it's relatively short and less steep compared to the others in this area (like Micheltorena, for example). That said, I don't know how poor Hardy made it past like the first dozen! It is pretty steep. And it's one of those stairwalks where the people who live alongside the stairs plop out their folding chairs, light up a smoke, and laugh at the tourists and people like me who live there but are trying to get a workout. Of course the joke is on them -- they're the ones who have to haul groceries and worse (hopefully not pianos!) up the steps to get to their homes.